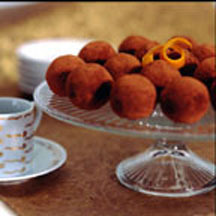 Finely ground chocolate wafer cookies and orange juice combine to make these delicate chocolate confections. Combine powdered sugar, cookie crumbs and 2 tablespoons cocoa in large bowl. Stir in orange juice concentrate and butter until combined. Stir in Nestlé Treasures. Roll dough into 1 1/4-inch balls. Roll in remaining cocoa; place in candy liners. Store at room temperature.